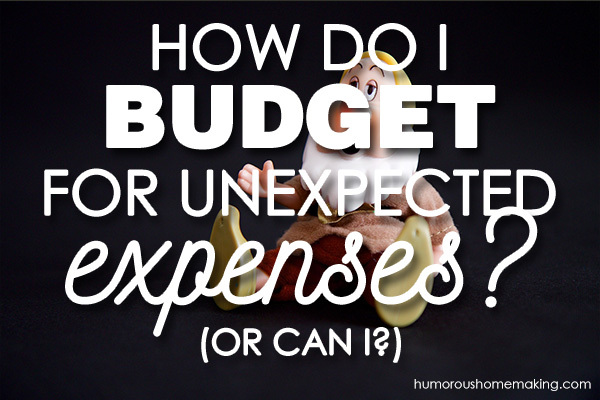 You are here: Home / Finances / How Do I Budget for Unexpected Expenses? Everyone at your husband’s work decides to pitch in and buy a birthday present for the boss. Your Aunt Betty is driving thru your town and asks to meet your for dinner. You decide at the last minute to take the family to the zoo for the weekend because of a really good promotion they’re running. All unexpected expenses! 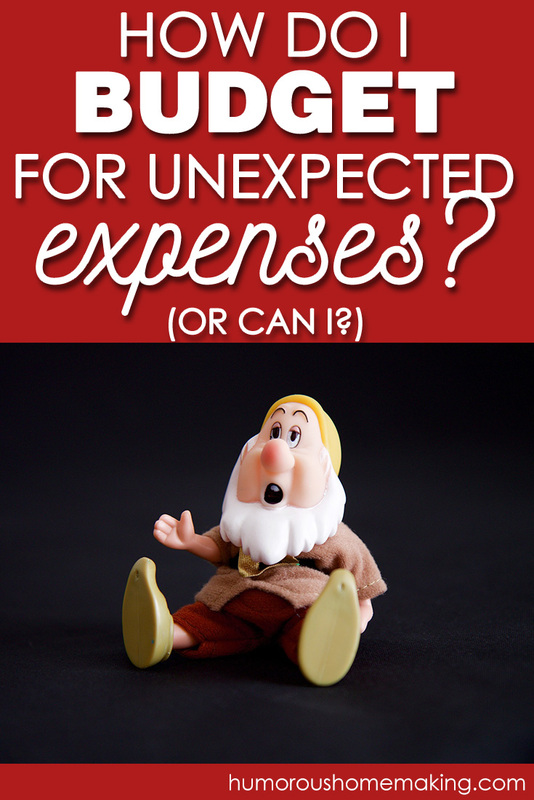 Some people will tell you that you should always say ‘no’ to these unexpected expenses. If you don’t have the money, then I absolutely agree. There will be times when stuff comes up and you just can’t do it. It doesn’t make you a bad person if you say no! It makes you a responsible adult. If you don’t have the money, never charge it. Especially when we were first married, there were times when we just had to say no, we’re not going to do that because we were paying down debt. Remember that anytime you tell someone no, it’s a mark of discipline. What happens when you are farther along in your budgeting journey and you do have the extra money? We don’t have a mortgage, but we have month-to-month expenses like water, electricity, food, my braces, etc. Each month, we sit down, look at our calendar and plan out our budget. Who is having a birthday? What trips are we taking? Do we need extra money for gas for some reason? What other expenses do we know are coming? Our automated Excel spreadsheet is free and might be helpful for y’all. Every single month our budget looks a little bit different…and yours should too. After we complete our monthly budget, we have an amount of money remaining that we call unallocated money. The unallocated money amount varies month to month, but is roughly $100-$200. Anytime during the month, we can pull out money from our unallocated line to use for unexpected expenses like birthday presents, dinners out with friends, spontaneous trips to the zoo, etc. Unallocated money just stays in our checking account until our account hits a certain amount, then we move any extra money over to our savings. This amount will be different for everyone; unallocated money is 100% based on your income and your expenses. Unallocated money is our cushion. And can’t we all agree, it just feels nice to have a cushion!? Without a cushion, it’s hard not to be tense and worried. If you don’t have the extra room in your budget – that’s okay! If you can’t do this right now, don’t lose heart, and aim to get there one day! A quick side note: having an amount in your budget as unallocated doesn’t mean you just throw caution to the wind and put tons of cash in that category. Make it a reasonable amount that will cover small things that might pop up but not enough that you lose discipline in your finances. Seeing other people’s ideas and what is working for them inspires me and I truly hope this post does the same for you! Don’t forget that just because something works for Barry and me, doesn’t mean you have to do it just this way. But maybe it’ll help you as make a plan for how to handle unexpected expenses in your home. We have monthly sinking funds for categories that are predictable, but not monthly bills. My bank doesn’t care how many checking accounts I have, so I literally created a bunch of separate accounts. We have a bank account for the cats’ vet bills, a bank account for propane fills and insurance premiums, a bank account for clothing and haircuts, a bank account for travel and recreation, one for gifts and household items, etc. Each month, we budget money to be moved over into those categories. When an expense comes up, we pull money from the appropriate account. They are all managed online, so it’s pretty easy. I love this suggestion. It seems like something unplanned comes up every month. Sometimes we would just say “no.” Usually, we would really struggle with figuring out where to pull money from to cover things like that. So simple and practical. Thank you!